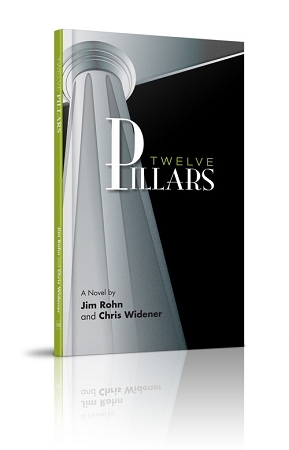 This is the hardcover edition of Jim Rohn and Chris Widener's Twelve Pillars. Who would guess that when Michael Jones' car broke down on the side of the road that it would be the beginning of a life-changing relationship? Walking to the nearest house, Michael stumbles across a plantation style mansion on an estate named "Twelve Pillars." Charlie, the estate's caretaker, helps Michael get back on the road again and also strikes up a relationship with him - and along the way teaches Michael the secrets of success - the Twelve Pillars of Success - that have made the owner of the house, Mr. Davis, a wealthy and successful man. This novel by Jim Rohn and Chris Widener will inspire you to take your life to the next level and beyond. It will challenge and encourage you to become the best that you can be! Imagine the opportunity to sit "at the foot of a master" and learn what it takes to be successful in every important way - financially, spiritually, relationally, etc. In "12 Pillars," a 120 page, one-sitting-read novel, Jim Rohn and Chris Widener, two of today's foremost authorities on success, take you through the fictional journey of Michael, a 40-something man who has come to the realization that life just hasn't turned out the way he once envisioned. Meeting Charlie, a wizened "property caretaker", he learns 12 Principles that help him turn his life around. Here's the really cool thing: This novel, and all 12 Pillars, is based on the lessons Mr. Rohn and Mr. Widener share in their world-renown live programs, but put into the form of one of the most captivating stories I've ever read. I can imagine that everyone who runs a company or organization will - once they read this book - buy a copy for everyone within their organization. If you're a parent, you'll *definitely* want to share this book with your child before they head off into the "real world." It's one of those books you wish you read when you were 18, but the next best time to read it is now.